During trials the correct measurement of metocean conditions is crucial for reproducibility, performance prediction and to avoid disputes between different stakeholders. MARIN believes its new C-DRONE can make it much easier to obtain accurate measurement data. MARIN has several systems in use to measure wave height and period. The most direct and accurate way to measure the wave characteristics is the use of a wave buoy. Yet, a buoy is rarely requested during trials because the retrieval process requires a separate support boat that can easily manoeuvre and pick up the buoy. And this is often too costly. To overcome this problem, MARIN evaluated airborne drones for the measurement of wave characteristics. Airborne drones have become widely available over the past few years, have increasing reliability and have lowered in price. However, for wave elevation measurements under strong, gusty wind conditions in a harsh marine environment their applicability and reliability is limited. Moreover, commercial deployment of flying drones requires expensive certification and training. 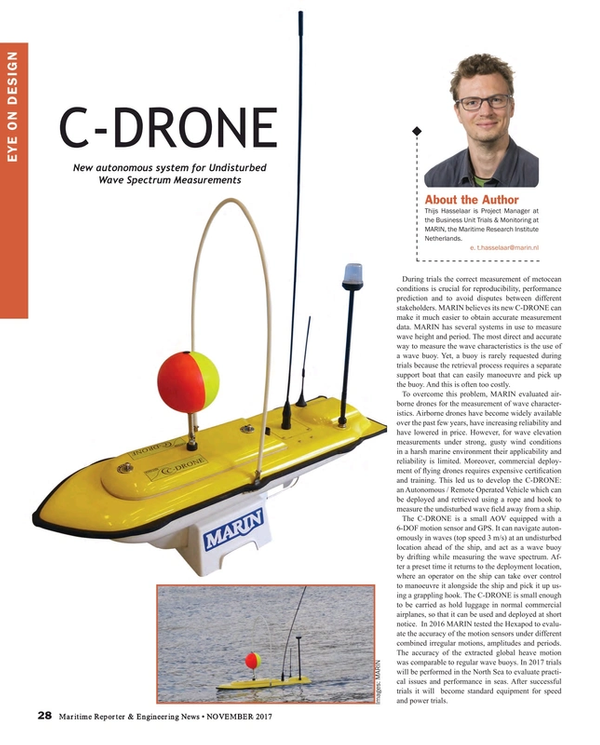 This led us to develop the C-DRONE: an Autonomous / Remote Operated Vehicle which can be deployed and retrieved using a rope and hook to measure the undisturbed wave field away from a ship. The C-DRONE is a small AOV equipped with a 6-DOF motion sensor and GPS. It can navigate autonomously in waves (top speed 3 m/s) at an undisturbed location ahead of the ship, and act as a wave buoy by drifting while measuring the wave spectrum. After a preset time it returns to the deployment location, where an operator on the ship can take over control to manoeuvre it alongside the ship and pick it up using a grappling hook. The C-DRONE is small enough to be carried as hold luggage in normal commercial airplanes, so that it can be used and deployed at short notice. In 2016 MARIN tested the Hexapod to evaluate the accuracy of the motion sensors under different combined irregular motions, amplitudes and periods. The accuracy of the extracted global heave motion was comparable to regular wave buoys. In 2017 trials will be performed in the North Sea to evaluate practical issues and performance in seas. After successful trials it will become standard equipment for speed and power trials. Thijs Hasselaar is Project Manager at the Business Unit Trials & Monitoring at MARIN, the Maritime Research Institute Netherlands.